Eco-friendly low-head river restoration structures such as block ramps are of paramount importance with regard to the control of sediment grade in rivers, particularly in the mountains. They also help in the stabilization of river bed and prevent damages due to excessive downstream erosion by dissipating flow energy. Although the hydraulic characteristics of block ramps in straight channels have been thoroughly studied, there are very less studies dealing with the analysis of scour mechanism downstream of block ramps in curved channels. In fact, to the authors’ best knowledge, there are no studies till date investigating the scour process downstream of block ramps in river bends, involving the effect of tailwater and ramp bed slope. Therefore, this study aims to analyze the hydraulic behaviour of block ramps placed at various positions on a curved channel incorporating the effects of the mentioned parameters. Furthermore, the equilibrium morphology of the resulting downstream scour has been analyzed and classified. 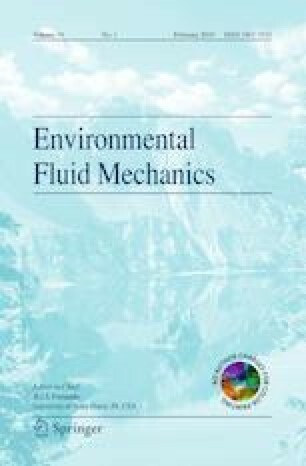 A dedicated hydraulic model was constructed, and a large range of in situ hydraulic conditions were simulated. Tests were carried out varying ramp slope and locating the structure at different positions along the channel bend. Data analysis revealed that the scour morphology is essentially three-dimensional and depends on flow characteristics, tailwater level and slightly on its location. Finally, a useful design relationship was also developed to evaluate the maximum scour depth taking into consideration the effect of channel curvature and the tailwater level. All authors equally set up the research, analyzed the results, and contributed to writing the paper. This research was funded by University of Pisa Research Project PRA_2018_35 “Approcci eco-sostenibili per i sistemi idrici e la riqualificazione del territorio in ambito urbano”.